I COME FROM A dysfunctional family... baseball-wise. My grandfather was a New York Yankees fan. His rebellious son, my dad, rooted for the Brooklyn Dodgers until they moved west and broke his heart in 1958. Resignedly, he later adopted -- or perhaps merely adapted to -- the Mets. In 1970, grandpa moved to Florida. About a year later, I went to my first ballgame, at Shea Stadium, cementing my allegiance to the Boys of Flushing for better or worse, mostly worst. 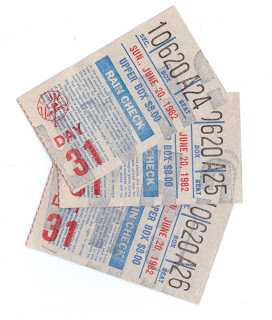 By June 1982, I was a somewhat gainfully employed high school junior, earning enough money bussing tables at a local deli for the Big Idea: I'd take my dad and visiting grandfather to a ballgame for Father's Day: a Yankees game. We would all be Bronx Bombers fans for a day. What could possibly go wrong? Grandpa was 77 and hadn't been to The Stadium since Mickey Mantle manned centerfield. He was old enough to have first-hand memories of Lou Gehrig, who even I admired, and the peerless Joe DiMaggio. "He didn't run after fly balls," gramps told me. "He proceeded." With dad's acquiescence, needed because he was our driver, we piled into his Oldsmobile and rode to the Bronx, where I bought three Upper Box seats for $8 a piece, about half a week's wages. Veteran Tommy John was starting for the Yanks. His opponent was Mike Flanagan, who'd edged John for the American League Cy Young Award three years earlier. To be sure, these weren't grandpa's Yankees. Aside from Dave Winfield, who was crushing home runs over that part of left-centerfield known as Death Valley -- on his way to a career-high 37 -- nobody was playing particularly well. George Steinbrenner was at the height of his intolerance. Having apologized to fans for losing the previous year's World Series, he'd already fired one manager, Bob Lemon, and would soon fire another, Gene Michael. Three managers in one season was a career high for the boss too. Still, the pitching match-up promised a good game and the hurlers didn't disappoint. Orioles' 2B Rich Dauer, singled with one out in the first inning, went to third on a base hit by outfielder Dan Ford, then scored on a ground out. Baltimore 1, New York 0. In inning three, the Bombers struck back. Shortstop Andre Robertson singled. Willie Randolph's double moved him to third. Ken Griffey Sr. walked, loading the bases for Winfield, whose sacrifice fly tied the game. Next, Lou Piniella walked, reloading the bases for 1B John Mayberry. Flanagan hit him with a pitch, forcing in Randolph with the go-ahead run and moving Griffey to third. He scored on a sac fly by catcher Barry Foote. Baltimore 1, New York 3. 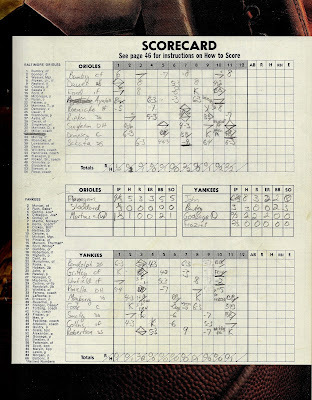 The Orioles clawed back in the seventh on hits by left fielder Gary Roenicke and rookie 3B Cal Ripken Jr.. Aided by a wild pitch, a throwing error and a Lenn Sakata sac fly, both men would come around to knot the score at 3-3. There it would stay through the end of regulation. John gave way to Shane Rawley after 6 2/3 innings. Tim Stoddard relieved Flanagan with an out in 10th and continued to keep the Yanks off the scoreboard. Rawley, fading, left the game with two on and two out in the top of that frame, in favor of future Hall of Famer Rich "Goose " Gossage, who got Roenicke on a flyout to Griffey in center. Ten innings in the book and the score was still tied. It was about to become untied. The rookie Ripken led off the 11th and skied to Winfield in left. DH Ken Singleton singled, then left for pinch runner Floyd Rayford, whose base running prowess was about to be rendered moot. Lefty-hitting catcher Joe Nolan was sent up to bat for starter Rick Dempsey against the right-handed Gossage. A day earlier, the Goose had pitched more than three of the 16 innings it took for the Yanks to beat the birds, 4-3. He was tiring. Nolan was a career understudy, a man whose glasses gave him the appearance of someone who might fix your appliances, sell you insurance or do your taxes. He certainly didn't look like the guy who would ruin your Father's Day. Nonetheless, he slugged a two-run homer off the Yankee closer. Suddenly, it was 5-3 Baltimore. The Bombers, who had mustered just one hit since their third inning outburst, were in trouble. This wasn't what I'd had in mind. Mayberry led off the bottom of the 11th by coaxing a walk from ex-Yankee lefty Tippy Martinez. Catcher Butch Wynegar, who replaced Foote in the 8th, grounded into a 5-4-3 double play. Two out, bases empty. Third-baseman Roy Smalley Jr. walked. Speedy right-fielder Dave Collins followed with a hit and suddenly the Yankees. had the tying runs on base for Robertson. They were alive and threatening. Pinch hitting for the shortstop -- whose career would be ended by a spectacular car accident on New York's West Side Highway a year later -- was regular 3B Graig Nettles. We hunched forward and watched: three generations of Harris men rooting for the Yankees. But the Yankee captain, whose likeness adorned the game program, struck out. Game over. United in disappointment, we piled back into the old '98 Regency and went home. 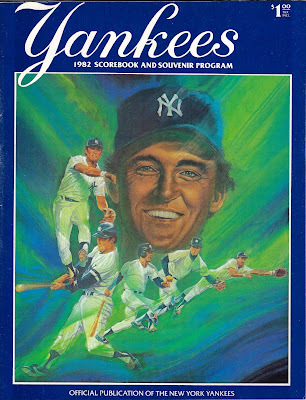 The loss dropped the Yanks to 30-31, on their way to an unsightly final record of 79-83. Clyde King, the last of Steinbrenner's three managers, couldn't stanch the bleeding as the New Yorkers finished in 5th place, 16 games behind the division winning Milwaukee Brewers. It was their worst season in 15 years.